Our Large leather wallet holds everything, it measures about 5" X 8.25" when folded and closed, it feels like a small clutch. 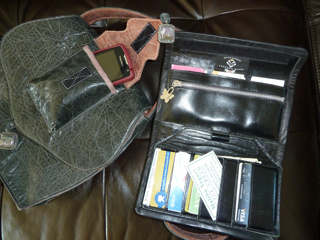 The Inside features one long zippered pocket for change, behind that are 3 slots for holding your business cards, opposite that is a credit card holding area with 8 slots for up to 24 credit cards or license, behind the slots is one long pocket for bills. There is a roll of leather here to slip a pen into. On the other side of the credit card holding area you can put a checkbook and register on either side, with room behind both to store larger items. The style is tri-fold with velcrow along the top for fastening. 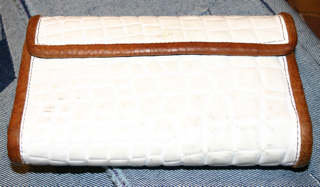 The interior is made from a smooth thin calf skin. 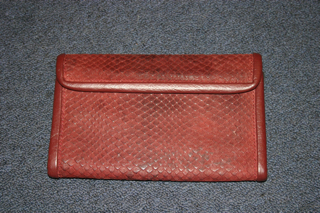 The exterior is a finished leather, with distinctive grain patterns or various prints on the leather. There are endless choices of leathers, suedes, or cowhide furs. 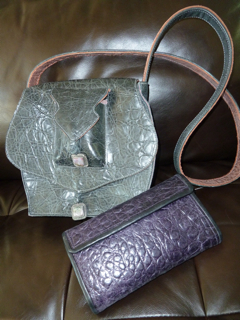 There are many colors and textures to chose from, including some exotics such as Ostrich, Crocodile or Snakeskin. which will be priced accordingly per order, availability upon request. 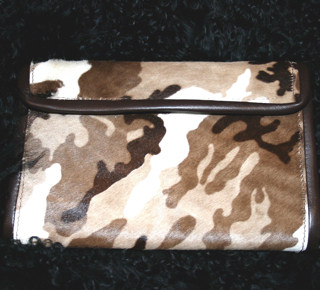 This wallet can also feature tapestries or "No-Animal" Leathers only on the outside of Wallet, and can be created to match our Purses and Bags. This item is by Custom Order.